We had a great stay here. Clean and has a well equipped kitchen. The terrace was a very nice place to hang out as well. The beds were a little small though, and make sure to bring your own padlock for the safe. Staff is very helpfull, even though check in was delayed, we were still allowed to use the showers. Would definitely stay here again! I really liked the hostel. it was clean and the vibe was lovely! the only thing was, that you could hear the sounds from the cafe downstairs very loudly. it woke me up at night a view times. super goed hostel, goede locatie. (tram op 4 min afstand) heel groot pluspunt, was de keuken (uit eten is duur in parijs). supermarkt op de hoek, en koken maar. heel vriendelijk personeel. schoon. de prijs is het echt waard 100 %. wat wil je nog meer. a wonderful expereince. Prices are cheap and the staf is very friendly and helpful. 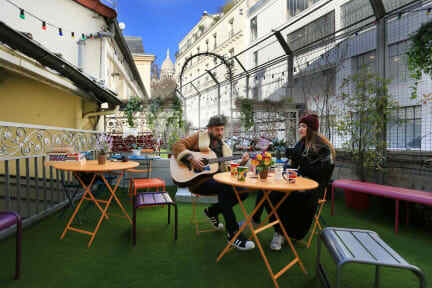 The perfect hostel. I think the best i ever had!